Last summer I interned with the UN Relief Works Agency (UNRWA) in Lebanon, which is a humanitarian aid agency that provides services to well over 415,000 Palestine-refugees living in Lebanon (over 10% of Lebanon's population). My experience at UNRWA last summer motivated me to return this summer with a program called LEAP, the Learning English Advancement Program, which I co-founded. LEAP brings American volunteers to the camps to teach English and recreational activities to refugee students, as well as learn more about the plight of Palestinian refugees to inform the American public upon their return home. UNRWA provides basic services such as education, health, relief and social services to over 4.5 million registered Palestine-refugees within the Middle East in general. Although Palestinian refugees have the "Right to Return" to their homeland under UN Resolution 194, as all refugees are granted that right under the refugee protocol, Israel refuses to adhere to the resolution and the international community has instead created a scheme of resettlement plans in Arab host countries. UNRWA was established as a temporary organization. 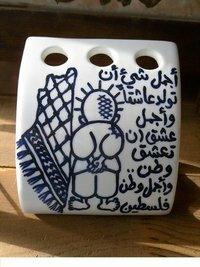 Unfortunately, 62+ years later it is still in existence since displaced Palestinian refugees are still not given the right to return to their home country--Palestine. Thus, they are forced to live in refugee camps in extreme poverty, with no national citizenship or identity, and under discriminatory social and civic policies. Palestine refugees in Lebanon have very limited access to the government's public health or educational facilities and no access to public social services. The majority rely entirely on UNRWA as the sole provider of basic services--this is particularly the case in Lebanon where they face harsh discrimination. Considered as foreigners (although three generations now exist in Lebanon), Palestine refugees are prohibited by law from working in most professions. This has led to a very high rate of unemployment amongst the refugee population and made living extremely difficult--to say the least. Frequently the Palestine-refugee population is overlooked in the Israeli-Palestine conflict, however, it is crucial to take into account the millions of refugees living in exile that are waiting to return home; that are waiting to return to Palestine and reclaim their stolen national identity. Without granting Palestinian refugees the "Right to Return" and resolving the refugee "issue", it is impossible to achieve a successful peace agreementin the region.